Daralyn’s path to motherhood was anything but traditional. While volunteering at a drug and alcohol treatment center for youth, she met sisters Jessica and Ashley – young teens struggling without stability, without a family. It didn’t take long for Daralyn to welcome them into her family through adoption. Relying on training and resources provided by Children’s Home Society of Florida, Daralyn learned how to care for children with frightening pasts and uncertain futures, and her natural gift for motherhood shone. Daralyn soon received a call she’d long hoped for – two precious toddlers needed a family. Without hesitation, she brought Alisha and Alia into her growing family. After suffering severe abuse at the hands of their birth parents, the little girls needed a loving forever home – they found it with Daralyn. It wasn’t long before we called her again. 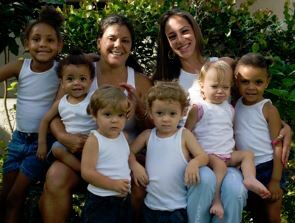 This time, she opened her home to newborn twins born addicted to drugs, both suffering from horrific withdrawal symptoms. Continuing to draw upon our support and education, Daralyn cared for the babies, nurturing them while they shook and screamed. A year later, she adopted the twins. And though she still welcomed foster children, she doubted she would adopt any more. Now with five little ones under her roof and two grown daughters starting families of their own, Daralyn recently completed her family with the adoption of her teen foster daughter.